My June Julep Maven box has arrived! I decided to go with the Modern Beauty box this month since I wasn't feeling the nail colors in the other boxes, too much. I am glad I opted for the Modern Beauty box though because, it contained useful essentials that come in handy when achieving a perfect canvas before color application. If you want effortless looking results, you have to prep and take care of the nails properly. Oxygen Nail Treatment: This conditioning nail treatment is a must-try if your nails are on the thin and fragile side. It's formulated with an oxygen technology that lets nails breathe, as well as anti-aging plant stem cells and a UV filter to protect nails. To best reap it's benefits, this treatment should be used alone, without the addition of another polish. I wouldn't say that my nails are overly weak, but they can be prone to breaking from time to time. So, I am excited to see if Julep's Oxygen Nail Treatment can improve the health and strength of my nails with continued use. I love how the sheer pink tint gives my nails a clean and pristine appearance. Oxygen Smoothing Base Coat: Like the Oxygen Nail Treatment, this base coat is also formulated with Julep's Oxygen Technology which allows oxygen to spread throughout nail beds, for a stronger and healthier nail growth. Julep's Oxygen Smoothing Base Coat also contains silica minerals which fills in ridges and helps color last longer. I think it's pretty cool how this dries to a smooth, matte finish. Buffer Blocks: I don't know how I managed to live without nail buffers. These are fantastic! They are quick and easy to use, and my nail beds have never looked or felt smoother. Ramona: I decided to add on Ramona to my box. I couldn't resist it's gorgeous creamy lavender rose hue. 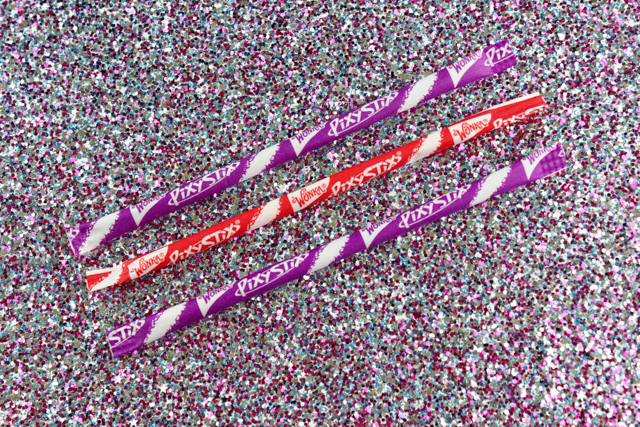 Wonka® Pixy Stix®: It's such a nice surprise when subscription boxes contain sweet, yummy treats in them. The Wonka® Pixy Stix® totally satisfied my sweet tooth craving. If you want to sign up for your own Julep Maven subscription you can do so, here. What did you all receive in your June Julep Maven boxes? Oooo..so that's what the cute looking bar thing are! I didn't guess that they were buffer bars! Adorable! I haven't used one in ages! I think the buffer blocks were my favorite items in the box!